Q sits second to the left of W’s husband. S’s daughter sits second to the right of U, who is sister of V. Only one person sits between W and V. W’ brother S sits on the immediate left of W’s mother. 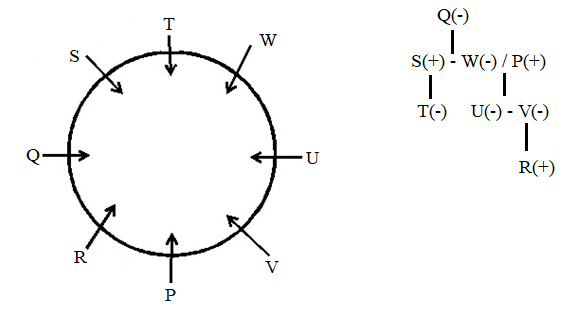 V is not an immediate neighbour of T. U is not an immediate neighbour of W’s husband. 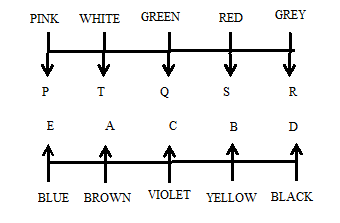 Only one person sits between P and U. V is the mother of R. No female is an immediate neighbour of Q. Only one person sits between T and W’s mother. 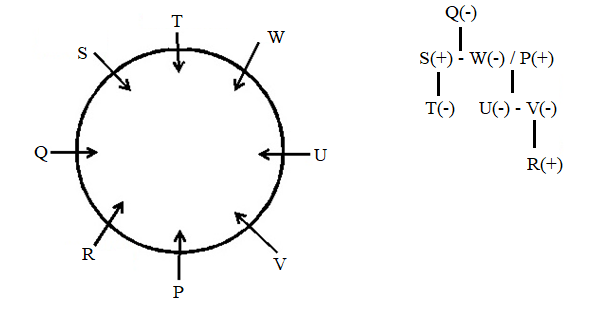 P is father of V.
1. Who among the following sits on the immediate right of Q? Q sits second to the left of W’s husband. Only one person sits between P and U.W’ brother S sits on the immediate left of W’s mother. S’s daughter sits second to the right of U, who is sister of V. Only one person sits between T and W’s mother. V is not an immediate neighbour of T. V is the mother of R. Only one person sits between W and V.U is not an immediate neighbour of W’s husband. No female is an immediate neighbour of Q. CASE 1:U is not an immediate neighbour of W’s husband. 2. Who among the following sits opposite to S’s daughter? 3. How many females are there in the family? Who among the following is third to the right of the second to the right of W’s husband? One person sits between A and the one who likes yellow colour. S faces the one who likes yellow colour. The immediate neighbours of S face the one who likes black colour. Only one person sits between the one who likes black colour and the one who likes violet colour. C faces the one who sits second to the left of P. The one who likes grey colour faces the D. The one who likes blue colour sits at the extreme end. R does not like pink colour. P faces the one who sits second to the left of the one who likes violet colour. 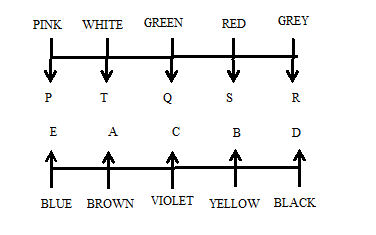 The one who likes red colour sits second to the left of the one, who faces brown colour. Only one person sits between C and D. T likes white colour. One person sits between the one who likes grey colour and Q. E faces the one who likes pink colour. 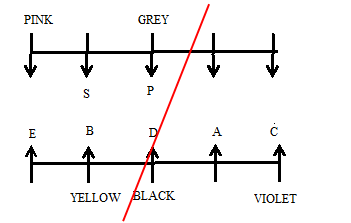 B sits to the immediate left of the one who faces grey colour. The one who likes brown colour facing north. One person sits between A and the one who likes yellow colour. S faces the one who likes yellow colour. The immediate neighbours of S face the one who likes black colour. Only one person sits between the one who likes black colour and the one who likes violet colour. P faces the one who sits second to the left of the one who likes violet colour. 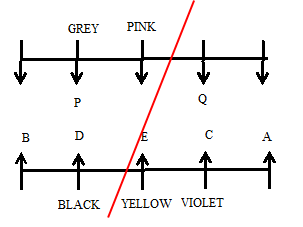 C faces the one who sits second to the left of P. Only one person sits between C and D. The one who likes grey colour faces the D. Only one person sits between C and D. One person sits between the one who likes grey colour and Q.B sits to the immediate left of the one who faces grey colour. E faces the one who likes pink colour. The one who likes blue colour sits at the extreme end. R does not like pink colour. The one who likes red colour sits second to the left of the one, who faces brown colour. T likes white colour. The one who likes brown colour facing north. CASE 1: The one who likes red colour sits second to the left of the one, who faces brown colour. The one who likes brown colour facing north. 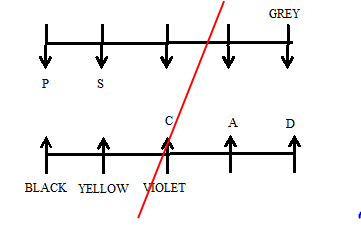 CASE 2: B sits to the immediate left of the one who faces grey colour. 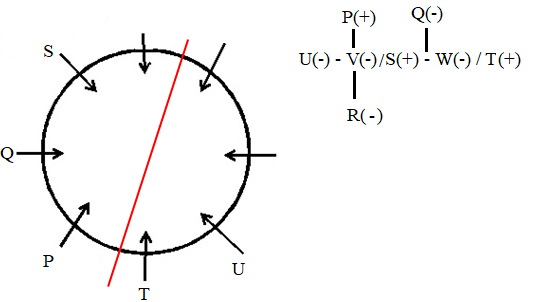 CASE 2(A): The one who likes red colour sits second to the left of the one, who faces brown colour. The one who likes brown colour facing north. 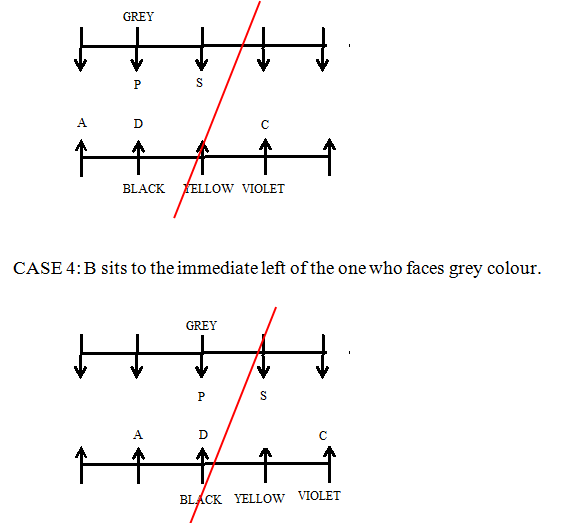 CASE 3: B sits to the immediate left of the one who faces grey colour. Q1. Who among the following sits on the immediate right of Q? Q2. Who among the following sits opposite to S’s daughter? Q3. How many females are there in the family? Q4. Who among the following is third to the right of the second to the right of W’s husband?